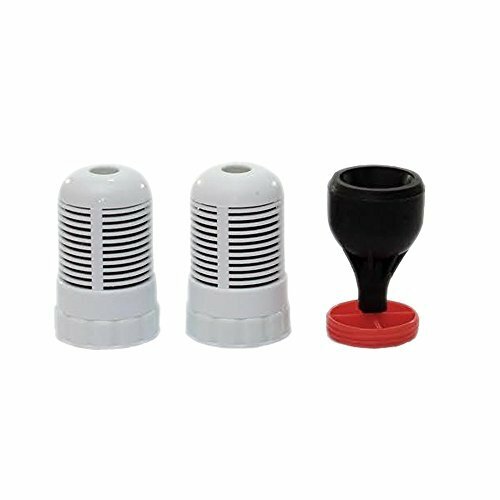 These are replacement filters for the gen 2 family water pitcher, If you have the gen 1 (1-40101-W) check out our listing that comes with the reservoir and filters. The regular filter removes or reduces up to 99.99% of the following contaminants found in drinking water: Aesthetic - Offensive tastes, odors, Chlorine, silt, sand and sediment. Chemical - Industrial and Agricultural contaminants such as PCB's, THM's, detergents, pesticides, herbicides, fungicides, insecticides (DDT), pharmaceuicals, etc. Dissolved Solids - Heavy Metals such as Aluminum, Arsenic, Asbestos, Cadmium, Chromium 6, Copper, Lead, Mercury, Zinc and up to 90% of Fluoride. Radiological - Radon 222. Replacement Filters for Seychelle 1-40101-2 Gen 2 Family Water Pitcher. These filters remove or reduce up to 99.99% of the contaminants found in drinking water. Provides up to 200 gallons of delicious, clean filtered drinking water. Cost effective. Replaces bottled water. Replacement filters are easy to order and install. All materials FDA food grade approved. BPA Free. Retains helpful trace minerals. If you have any questions about this product by Seychelle, contact us by completing and submitting the form below. If you are looking for a specif part number, please include it with your message.